This update is a bit late because I was certain that Connor would be crawling by now. 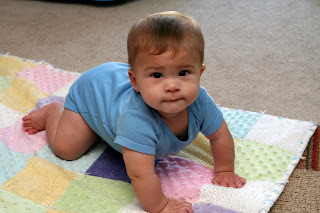 He's so darn close I wanted to wait until I could officially say he's crawling. But he's not quite there yet. He gets up on his hands and knees and wobbles around. He'll actually move his knees forwards a bit, but he isn't coordinating his hands yet, and he ends up falling on his face. 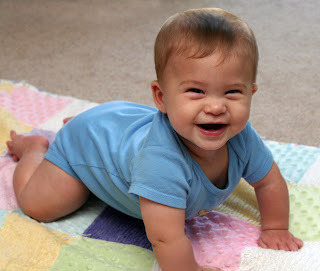 90% of crawling is enough to get him into trouble though. He always seems to end up near the coffee table (going to have to take that out of the living room soon) or he ends up finding one of Chloe's toys. I think she brings them over near him, and he's more than happy to dig his drool covered fingers into Chloe's filthy rope toy.